Jean Ferdinand Monchablon was born in the Vosges region of northeastern France in the village of Châtillon-sur-Sâone. Although modest in size today, Châtillon-sur-Sâone has an impressive history of settlement dating back to the Neolithic period. Its location at the confluence of the Sâone and Apance rivers, and at the junction between the provinces of Champagne, Franche-Comté and Lorraine has historically made this tiny village a crossroads of conflict, most recently between France and Germany. Hence, Jean Ferdinand Monchablon was also known as Jan, the more Germanic form of his name. Born on 6 September 1854, young Jean’s family apparently moved to the Breton city of Nantes while he was still in elementary school; there he won a Writing Prize at the school of Notre Dame de Nantes. Monchablon’s academic skills were sufficiently notable that he was teaching at a college in Quimper, Brittany by 1875 at the age of 19. It was here too that he met his future wife, Fanny Elisa Julien, a talented pianist. However, his interest in painting eventually took him to Paris and to the Ecole des Beaux-Arts where he studied first with Jean Paul Laurens, a fiercely anti-clerical and republican academic, and then with Alexandre Cabanel from 1883-84. In spite of this training in the studios of two such committed Academicians, Monchablon’s primary interest lay in landscape painting. Beginning in 1881, Monchablon exhibited successfully—and consistently—at the annual Salon. His early landscapes, such as Forest at Châtillon-sur-Sâone of 1885 (which is signed Jan Monchablon), are an intriguing blend of almost photographic realism with rather startling Impressionist light. The combination of these elements produced an image that is very immediate and tangible, but also somewhat meditative. During these early years of his career, Monchablon painted primarily in the countryside surrounding Paris, absorbing the scenes that he no doubt knew from the paintings of both the Barbizon School of the 1830-1860s and the more contemporary Impressionists. However, like other artists of his generation, Monchablon ultimately chose to focus on the landscape of his native region rather than embrace the peripatetic life of Corot or Daubigny. After many years of regular visits to his hometown in search of landscape motifs, Monchablon solidified his commitment to Châtillon in 1886 by signing a ten-year lease on property there, and moving his family from Paris to the country. Like so many others in this wine-growing region, he planted a vineyard to help defray expenses, and seems to have settled quite comfortably back into village life. 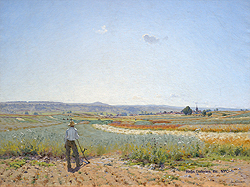 On painting expeditions throughout the region, Monchablon devoted himself to capturing the characteristic landscape of the Sâone river valley. In images such as River Landscape with a Figure, we see a solitary woman strolling by the riverbank under an exquisitely blue summer sky; like many of Monchablon’s paintings, there is a stillness here, almost a sense of reverie or personal reflection. The model for the female figure was most likely his wife Fanny. In other works, such as Village with River and Cows, the models are known to be local villagers who were happy to sit by the river fishing while Monsieur Monchablon sketched them. Monchablon’s move to Châtillon was a success. In 1889, he received a Silver Medal at the Exposition Universelle, and his work was consistently well received by both Paris critics and the public. At the Salon of 1895, Arbres en fleurs [Flowering Trees] was particularly cited as “pouring forth perfume” while Champs de blé [Fields of Wheat] was noted for its “strong brushwork and beautiful tonality.” [i] Success with his landscape paintings did not preclude accepting commissions for occasional portraits however. In 1896 and again in 1897, Monchablon exhibited a portrait at the Salon. The 1896 portrait of Monseigneur Turinaz was almost guaranteed to be a success in Paris, as it depicted the patriotic bishop giving a rallying speech on the anniversary of the Battle of Gravelotte, (a decisive victory for the Prussians in August 1870) flanked by two beautiful young women representing the lost provinces of Alsace and Lorraine. [ii] The emotional fervor associated with the loss of Alsace and Lorraine ran very high in the 1890s; and Monchablon’s position as a native of Lorraine made his portrayal of this event all the more stirring. The turn of the century brought an additional honors in the form of another Silver Medal at the Exposition Universelle in 1900 and a Third Class medal at his last Salon exhibition in 1904. 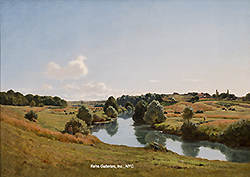 Simultaneously, Monchablon continued to develop the landscape images that are at the core of his work, emphasizing the luminous skies above the Sâone river, and the rich fields of the surrounding countryside. Following his death in 1904, Monchablon was posthumously admitted to the Legion of Honor in 1905. [i] Gustave Haller. Le Salon, Dix ans de peinture Salon de 1895. (Paris: Calmann-Lévy,1902). 228. [ii] Gustave Haller. Le Salon, Dix ans de peinture Salon de 1896. (Paris: Calmann-Lévy,1902). 347.